The earliest known crime novel (labeled as such) is "The Rector of Veilbye" by the Danish author Steen Steensen Blicher, published in 1829. Better known are the earlier works of Edgar Allan Poe (e.g., "The Murders In The Rue Morgue " (1841), "The Mystery Of Marie Roget" (1842), and "The Purloined Letter" (1844)). Wilkie Collins' epistolary novel, "The Woman In White", was published in 1860, while "The Moonstone" (1868) is often thought to be his masterpiece. French author Émile Gaboriau's "Monsieur Lecoq" (1868) laid the groundwork for the methodical, scientifically-minded detective. 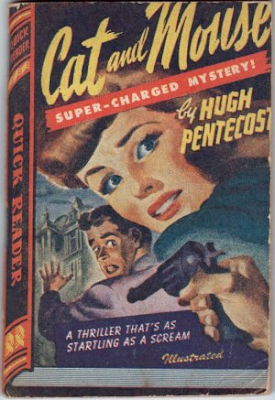 The evolution of "locked room mysteries" was one of the landmarks in the history of crime fiction. The Sherlock Holmes mysteries of Arthur Conan Doyle are said to have been singularly responsible for the huge popularity in this genre. A precursor was Paul Féval, whose series "Les Habits Noirs" (1862–67) features Scotland Yard detectives and criminal conspiracies. The evolution of the print mass media in the United Kingdom and the United States in the latter half of the 19th century was crucial in popularizing crime fiction and related genres. Literary 'variety' magazines like "Strand", "McClure's", and "Harper's" quickly became central to the overall structure and function of popular fiction in society, providing a mass-produced medium that offered cheap, illustrated publications that were essentially "disposable". Like the works of many other important fiction writers of his day —e.g. Wilkie Collins and Charles Dickens — Arthur Conan Doyle's Sherlock Holmes stories first appeared in serial form in the monthly "Strand" magazine in the United Kingdom. The series quickly attracted a wide and passionate following on both sides of the Atlantic, and when Doyle killed off Holmes in "The Final Problem", the public outcry was so great, and the publishing offers for more stories so attractive, that he was reluctantly forced to resurrect the character. Later a set of stereotypic formulae began to appear to cater to various tastes.